Killough Massacre, from Ghosts of East Texas and the Pineywoods by Mitchel Whitington. "Ghosts of East Texas and the Pineywoods"
When I first started researching this chapter, I wasn�t quite sure about it being a bona fide ghost story. I had been told about the spirit of an Indian in full battle dress appearing on a horse, and a mysterious fog that appeared even on warm, sunny days. I thought that I�d investigate anyway, and it turned out to be one of the most interesting journeys that I made during this book. It all started when I was putting together some information for another chapter. I heard about a huge monument in the pineywoods of East Texas that marked one of the worst Indian massacres in the history of this part of the state. The story starts in December of 1837, well over a year after Sam Houston and his men soundly defeated General Santa Anna at the battle of San Jacinto, which won independence for Texas. Issac Killough, Sr., moved his family from Talladega, Alabama to East Texas and purchased land from the newly formed Republic. The property had originally been part of a treaty settlement between the Texas Revolutionary Government and the Cherokee Indians negotiated by John Forbes, John Cameron and Sam Houston. In December of 1837, however, the Senate of the new nation of Texas nullified the treaty. The Cherokee weren�t all that happy with the treaty because it greatly reduced their lands � since they were led to believe that it would give them a permanent home, however, they accepted the terms. Some bitterness still existed among many tribe members, and the nullification of the treaty only exacerbated those feelings. The stage was set for an inevitable clash between the Texans and the Cherokee. On Christmas Eve of 1837, Issac Killough didn�t know about this rising animosity with the natives. His four sons, two daughters and their husbands, and two single men, Elbert and Barakias Williams all settled on the land. Over the next several months they built houses, and planted crops to sustain their families. The corn was ready to harvest by August, but word had reached the settlers of a growing threat by the Indians. 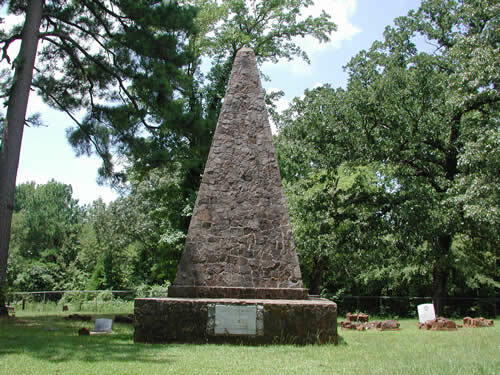 The Killough party joined with other settlers and fled to Nacogdoches for safety. In a month or so, the threat seemed to have dissipated, or so the Killoughs thought. They struck a bargain with the Indians to allow them to return to the land to harvest their crops, promising to leave before the first frost of winter. 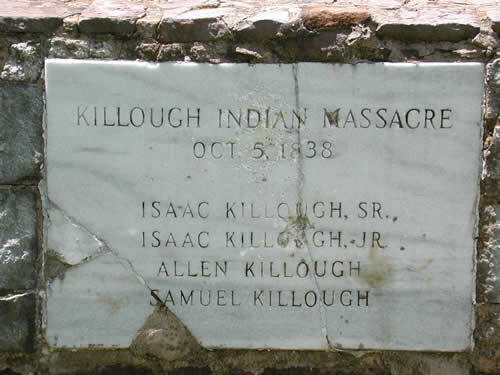 Apparently not all of the Cherokees respected the arrangement, however, because on the afternoon of October 5, 1838, a renegade band attacked and killed or kidnapped eighteen unarmed members of the Killough party, including Issac Killough, Sr., himself. The survivors, which included Issac�s wife Urcey, began a harrowing journey to Lacy�s Fort, forty miles south of the Killough settlement. When they arrived there safely, an enraged General Thomas J. Rusk organized a militia and rode out in search of the Indians. Rusk�s men caught up with them near Frankston, and defeated them in a skirmish in which eleven of the Indians were killed. The Killough Massacre was the largest Indian depredation in East Texas. The bodies that were found were buried at the site, and in the 1930s the W.P.A. erected an obelisk made of stone to mark the location. In 1965 the cemetery was dedicated as a Texas Historical Landmark, and the area is now enclosed by a fence with a small parking lot beside it. Before I actually visited the monument, I�d heard quite a bit about supernatural activity there, including the aforementioned sighting of a Cherokee warrior and the mysterious fog. Several paranormal investigators who�d been there had regaled me with stories of odd temperature readings, electric fields, and other scientific measurements often associated with ghosts. I wanted to see the place for myself, though, both for the historical aspects, as well as the spirits that might be showing up there. I finally gave up, and pressed on to other destinations. By then it had become a quest for me, though, so I knew that I�d return with a more detailed map and much better instructions. In a few weeks� time, I�d found someone to give me precise driving directions, and I followed them on an online map before ever leaving home. If the monument was where they said it was, I�d been all around it on my previous visit, and had even driven past the turn-off road. Armed with that information, I set out for Jacksonville once again. Sure enough, I drove straight to the monument. I have to say that when you first see it, the stone obelisk is quite impressive � the stone composition has the same look as W.P.A. buildings from the 1930�s. The graves of those who were found dead are around its base, and the entire area is surrounded by a fence with a historical marker near the entrance. It is beautifully kept, and on that particular day, very serene. When I got out of my car I noticed one thing that truly turned my stomach � someone had spray-painted a pentagram on the parking lot. If I live to be three hundred years old, I will still never understand how some people can bring themselves to vandalize property like that� especially at a sacred place such as a cemetery. I just shook my head, sighed, and continued on. I walked through the gate, and walked around to take a good look at the place. As I walked around inside the fence, a rush of emotion hit me � it was as if I was feeling an overwhelming sense of fear. I think that this was one of the strongest impressions that I had in the course of writing this book. It was literally all that I could do to keep from running back to my car and locking the doors. There was certainly no rational reason for the feeling. The place seemed to be very safe, and although it was far out in the country, there were many homes within a short distance. I simply couldn�t explain the feeling that I was experiencing, and the longer I stayed, the more intense it became. The scientific side of me was questioning whether or not my imagination could simply be getting the best of me, but I dismissed that notion immediately. It was too strong a sensation, and try as I wanted, I couldn�t get rid of the sense of dread. As I snapped a few photos, I realized that I�d had as much as I could stand. Something was urging me to get away from there very quickly, so I did. I managed to keep from running, but I did walk rather quickly. I also couldn�t help but look back over my shoulder again and again, since I was sure that something was coming for me. I almost jumped into the car, slammed the door shut, and then hit the electric locks. I felt better, but not that much. It wasn�t until I was several miles down the road that I was feeling like myself again. Whether I had been influenced by supernatural forces at the massacre site, or I�d just picked up on the residual feelings from that terrible event, I�ll probably never know. I want to go back though, if for no other reasons than to pay my respects to the settlers who are buried there. It was an experience that I want to explore further. If you visit Killough Monument, please remember that is a memorial to a family who died in a very tragic way. As with any cemetery or sacred ground, be respectful, and please do not take anything out with you but photographs. From the intersection of Highway 69 & Farm/Market (FM) Road 855 go west on FM 855 until you reach FM 3405. There is a sign there (or was at one time) that reads �Killough Monument� and points to the left. Turn left on FM 3405 and go just about .4 miles to FM 3411. Turn right on FM 3411 and go .6 miles until you reach a road with a green gate with a huge boulder on either side. That is actually FM 3431, but there is no sign there. Turn left and proceed through the gate � the monument and cemetery are at the end of the road. Excerpted from "Ghosts of East Texas and the Pineywoods"
Larissa, Texas - Site of the Killough Massacre. Ghost town.